Fabric stiffener makes fabric firm and rigid for craft projects. Commercial stiffeners are sold in craft stores but you can make your own homemade fabric stiffener that will be less expensive. The homemade stiffener can be used to make fabric flowers or leaves, which could be glued to branches. 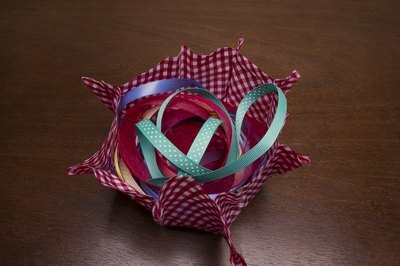 To make a fabric bowl, immerse a square piece of fabric in the homemade stiffener and smooth it over an upturned cereal bowl, letting it dry for 24 hours. 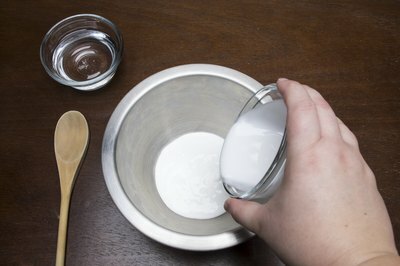 Measure 1/2 cup of white glue and pour it into the bowl. Measure 1/2 cup water and pour it into the bowl. 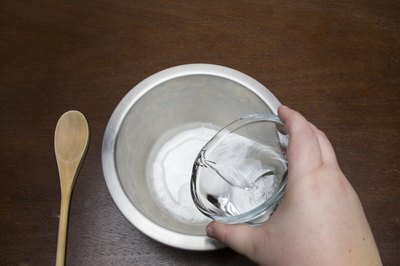 Stir the glue and water together with the wooden spoon until it is blended and has the consistency of milk. Pieces of fabric should be immersed into the stiffener, smoothed out on flat or curved surface and allowed to dry for 24 hours.